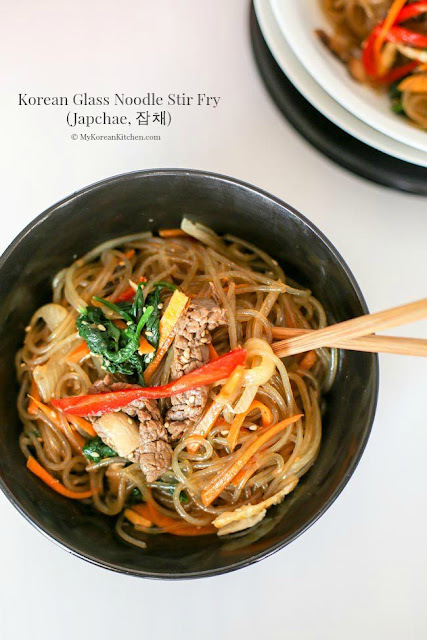 The most comprehensive and authentic Japchae (Korean glass noodle stir fry) recipe! Japchae or chapchae (잡채) is a very popular Korean dish. It is the number one sought after dish particularly during the Korean festive holidays (e.g. New Year’s day and Harvest festival) but it is also enjoyed on any other common day as well. Japchae translates as mixed vegetables. When it was first invented in the 17th century, japchae was a noodle-less dish. But nowadays, the main highlight of the dish is glass noodles, which is made from sweet potatoes, along with colorful vegetables and well seasoned meat. Cooking oil – I used rice bran oil. **If you’re not sure of the above Korean cooking ingredients, check my 30 Essential Korean Cooking Ingredients list! Prepare the rib eye fillet by gently wiping/soaking off the blood with kitchen paper. Thinly slice it and put the strips into a medium bowl. Add the “beef marinade” and gently mix the sauce into the meat. Cover the bowl with food wrap and leave it on the bench for about 30 mins (until you get the rest of the ingredients ready). Get the rest of ingredients ready per below. – Prepare the vegetables as instructed in the “main ingredients” section. – Put the sliced mushroom into a medium bowl and add 1 Tbsp of “noodles & mushroom marinade” mixture. Mix them well. Leave it on the bench until you cook it (in about 20 mins). – Boil some water in a medium pot. Once the water starts to boil (5-6 mins later), dip the spinach in for 5 to 10 seconds and scoop it out with strainer (or you can drain the water out). Quickly cool down the spinach by running it under cold tap water. Squeeze the spinach to remove any excess water and put it into a mixing bowl. Add the “spinach seasoning” and mix them evenly and lightly. Put it into a large mixing bowl where we will be adding all the other ingredients in later. – Boil some water in a large pot. Once the water starts to boil (6 to 8 mins later), add the noodles and boil them for 7 mins. Drain the water. Rinse in cold water to cool down the noodles and let the water drain for 1 to 2 mins. Cut the noodles with a pair of kitchen scissors a couple of times. (between 15 to 20 cm (6 to 8 inches) length is good). Move the noodles into a mixing bowl and pour in the rest of the “noodles & mushroom marinade” mixture. Mix them well. Leave it on the bench until you cook it (in about 10 mins). Start cooking the prepared ingredients per below. Follow the order if you can. We are cooking lighter colour to darker colour and will be using only one non-stick pan/skillet. Once each step is completed, move them into the large mixing bowl (except for the first two – egg white and egg yolk), where we will be mixing all ingredients in before serving. -Beat the egg white with a fork. Add some cooking oil (1 tsp) and spread it well. Pour the egg white mixture and cook both sides on low heat (1-2 mins). Move it onto a plate or clean cutting board. -Beat the egg yolk with a fork. (If necessary) add some cooking oil and spread it well. Pour the egg yolk mixture and cook both sides on low heat (1-2 mins). Move it onto a plate or clean cutting board. -Add some cooking oil (1 to 2 tsp, if necessary), the onion and pinch of salt and stir fry it until it is cooked (1-2 mins) on low to medium heat. -Add some cooking oil (1 to 2 tsp, if necessary), the carrots and pinch of salt and stir fry until it is cooked (1-2 mins) on medium heat. -Add some cooking oil (1 to 2 tsp, if necessary), the red capsicum and pinch of salt and stir fry until it is cooked (1-2 mins) on low to medium heat. -Add some cooking oil (1 to 2 tsp, if necessary), pour in the marinated mushroom (incl. the residue sauce from the bowl) and stir fry until it is cooked (1-2 mins) on low to medium heat. -Add some cooking oil (1 to 2 tsp, if necessary), pour in the marinated meat and stir fry until it is cooked (2-3 mins) on medium heat. -Add some cooking oil (1 to 2 tsp, if necessary), marinated noodles and stir fry until it is cooked (2-3 mins) on low to medium heat. Thinly slice the egg white and egg yolk like match sticks. Add them into the large mixing bowl as used above. Add the rest of the “finishing touch” ingredients – sesame oil and sesame seeds in the large mixing bowl and mix them gently and evenly with your hands. (Watch your hands as the ingredients, particularly the noodles might be still hot. You can also use a salad server to mix initially then mix with your hands once it cools down enough.) Serve and enjoy! 0 Response to "KOREAN GLASS NOODLE STIR FRY (JAPCHAE) "